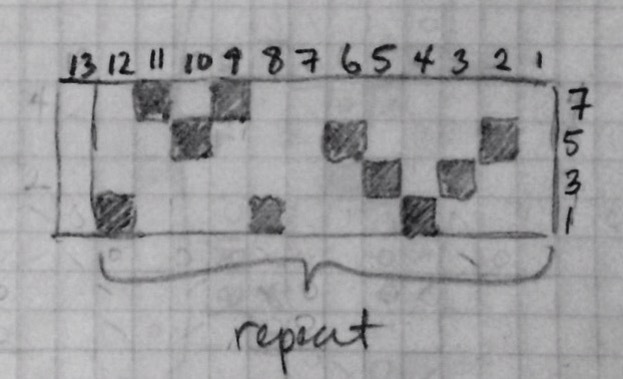 It occurs to me that it might be helpful (for other designers at least) to explain how I use my chart software to make mosaic knitting charts. For one thing, while there is a mosaic knitting format built into StitchMastery, it isn’t the one I personally prefer, so I do some extra editing to make my charts in the Barbara Walker format. This is not a post about how to design mosaic knitting stitches; it is a post about how to produce a particular kind of chart format in the StitchMastery software. I don’t know enough about other knitting chart software to know how the methods translate. There’s a lot of shawls and sweaters that make use of fancy lace, but that also have sections of simpler or smaller lace – having the contrast can make the fancy lace stand out more. Often the simpler lace is a mesh of some sort, like Feathered Lace Ladder. Other times it’s a simpler lace with a similar feel that fits in the right number of stitches, as Embossed Leaf Lace might, depending on the more complex pattern. I’ve been wondering for a while if it might be possible to use a subset of the rows of a fancy stitch to make a simpler lace that would coordinate well with the fancy stitch pattern. The only way to find out is to try! So I did, with several samples. My first post on what I’m starting to think of as hex lace (though I’m sure someone has a different name for it already – anyone know?) was my first exuberant foray into writing about it, but I’ve been thinking about it more, and there’s more factors to consider than I wrote about at first try. Figuring out how to make the diamonds that tile nicely for a crescent shawl has felt rather like trying to drink from a firehose in regards to filling up my head with ideas. The method in question isn’t only of use for secret code, of course, and I’ve been playing around with some other ways to use it.